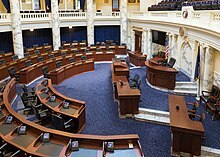 The Idaho Legislature consists of the upper Idaho Senate and the lower Idaho House of Representatives. Idaho is divided into 35 legislative districts, which each elect one senator and two representatives. There are no term limits for either chamber. The crossing of upper and lower house districts into a single constituency is found in only seven U.S. state legislatures: Idaho, Arizona, Maryland, New Jersey, North Dakota, South Dakota, and Washington. Based on 2010 census data, each legislative district in the state of Idaho had approximately 44,788 residents. Districts are reapportioned every 10 years. The next reapportionment is expected to occur after the 2020 census and take effect as of the 2022 election. Currently both houses of the Idaho Legislature are controlled by the Republican Party with large majorities. In the 2017 64th Legislature the Senate is composed of 6 Democrats and 29 Republicans. The House is composed of 11 Democrats and 59 Republicans. In terms of single party strength the Idaho Senate is tied with South Dakota for the third most Republican controlled senate in the nation behind Wyoming (27–3) and Utah (24–5). The Idaho House is tied with Utah as the second most Republican controlled lower house in the nation only trailing Wyoming (52–8). The Idaho State Capitol Commission  was created by Governor Phil Batt in 1998. The Commission undertook the leading role of extensively remodeling the capitol building starting in 2007. The 2008 and 2009 sessions of the Idaho Legislature met in converted courtrooms in the old Ada County Courthouse. The capitol building was official re-opened and re-dedicated on January 9, 2010. ^ "L93.pdf" (PDF). legislature.idaho.gov. Archived from the original (PDF) on 6 September 2015. 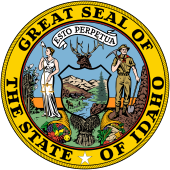 ^ a b "Idaho State Constitution Article III". sos.idaho.gov. Retrieved 2 February 2018. ^ Idaho State Capitol Commission. Accessed 3 August 2007.